Among those that won't become switchers, Microsoft's own worst enemy is itself, as it needs to prove that Vista is a worthwhile upgrade to XP when XP is already so refined. For many users in the consumer space, Vista is simply a version of Windows where (to borrow a quote from Field of Dreams) "If you build it, they will come." These people will get Vista on their new computers and they'll like it because it is good, but having never had the chance to decide if they didn't want it. Now two and a quarter years later we can see the outcome of that. It’s not favorable to Microsoft. While Vista’s adoption has not been a failure, it hasn’t necessarily been a success story either. Microsoft’s own worst enemy was XP, and the users complacent with it have been in no big rush to upgrade. The primary vehicle for moving Vista has been new computers, and even that has taken a hit in the kneecaps with the sudden rise of netbooks, which fit poorly with an OS that was made for newer, faster computers. Further complicating matters is that the quality of Vista wasn’t particularly stellar at launch. We’ve already covered this with our Vista SP1 article, so we won’t completely rehash this, but specific performance problems such as file copies (local and networked) and Vista’s hunger for virtual address space quickly made themselves evident. Netbooks drove this point home even harder –Vista doesn’t do so well with so little RAM. Finally, Apple deserves a great deal of credit here for driving the stake into the public opinion of Vista. The extremely popular Get a Mac campaign took the dissent from above and managed to amplify it and sew it into the public at large. Apple made it popular to hate Vista, and Microsoft did too little too late on the marketing front to counter that. Never underestimate the power of marketing – many people can tell you they don’t like Vista, few can tell you why. That’s marketing. Even though many of the technical problems were fixed before or at the launch of Vista SP1, by then it was too late. The public had become permanently dissatisfied with Vista. Regardless of the quality of the OS these days, the Vista name has become poisonous. Of course as far as consumer sales are concerned, this hasn’t significantly dented Vista adoption. Vista’s still going out on virtually every new consumer-level computer shipped. People may be dissatisfied, but so far they’re not doing anything about it other than complaining. Business users on the other hand are acting, or rather are not acting. They’re not upgrading to Vista on existing computers, and on new computers they’re still installing XP. Vista’s not taking at the corporate level, and that’s Microsoft’s more immediate problem. So here we are today with Windows 7 Release Candidate 1, Microsoft's grand attempt at taking Vista and building a more palatable operating system out of it. With Windows 7, Microsoft has ripped the Vista playbook to shreds and they are going an entirely different route. The goal: make Windows 7 successful before it even ships. development of the technology is quite rapid. My computer specifications are not strong for Windows 7 that high quality. specification of my computer, intel core 2 duo, 1 Gb RAM, VGA Nvidia 7300 GS. microsoft is very cool. can make the OS with a relatively quick time. First, I did not read all the comments, so if this has already been stated, I do apologize. For that matter, after the "Standard Test Bed" page I stopped reading the article. So .. maybe these issues have already been discussed. 14th. I still don't see an SP2 installer, but I can do a clean install with SP2 already slipstreamed. So ... I've looked and looked, but I can not find an XP Pro x64 SP3 anywhere. And according to Microsoft around last September, there was not going to be an WinXP Pro x64 SP3. So ... if you do have this SP3 around ... please let me know what MSDN/TechNet or whatever subscription you have so I can upgrade mine ... or point me to the release page. 2) Concerning corporate IT ... one of the issues mentioned at the beginning of the article is the computing resources needed to run Vista ... which to me alludes to the fact that many companies chose not to upgrade to Vista based on HW requirements (of course Vista without Aero can run on many "lower" configurations, but of course the average company employee does not know this). I digress ... your test bed platform is not really anything that CorporateIT depts will be deploying. Core i7 ... released 7 months ago ... 6GB RAM. Please ... if you are going to try and "proove" that performance is decent with Windows 7 ... at least run some test systems that are not the toys we dream of, but the systems that are installed in the office. Until Microsoft and folks like you understand that companies can not afford to always buy new HW, the new OSs have to run on the last generation technology (actually more like HW from 2 years ago) ... your comparisons and results are useless ... and my 18month old Lenovo T61 does exactly what I need it to do. So, there would be no reason to upgrade to Win7 until MS End-of-lifes WinXP. Moving on from Vista 32, I have to say i'm impressed. There are very subtle changes and tweaks which actually make the experience better. 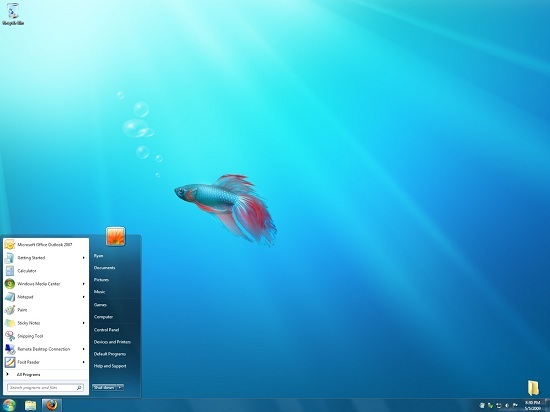 A simple example would be the new taskbar, Jump lists and Aero peek feature. I for one dont like a million windows open on my desktop, somehow i always found it cumbersome and cluttered but within a couple of hours of using Windows 7 i found myself using 10-15 windows without getting bothered by the clutter. Never used a Mac but these new features actually have both form and function. Support for canadian television in canada has always been limited in Media Center. Since HD digital over the air broadcasts (atsc)became available in the US, this has been supported in Media Center but not if you lived in Canada. Digital tuners are DISABLED by media center in all versions including Windows 7. This is in spite of the fact that canada uses the same ATSC system as the US. Many hacks have appeared but they always seem to be disabled by updates. This continues in Windows 7. As soon as the software determines that you reside in Canada, it disables the ATSC tuner. But get this. South Korea uses the same ATSC standard and it IS supported in that country. There are a lot of forums (such as the green button, run by the media center developers)that discuss this to no avail. No amount of questions, emails, or anything will get a comment from Microsoft. Even when MSVP's try to take up the battle nothing gives. There has been a lot of hope for Windows 7, that it would finally be supported, but alas, it is the status quo. My question is will Microsoft give a warning about the version of Windows 7 that contain media center for the canadian market telling canadians that their digital tuners will not work? I really wish that some website with industry influence (hint...hint) would expose this pointing out to the canadian market that they should not buy Windows 7 if they want to use the media center. Replace the function of minimising other windows with one that makes the window being shaked always on top. Now this is a useful function. I think people might have over-estimated Vista as the OS that will sweep across the world and change computers as we know it over-night. It didn't exactly turn out as expected, but I don't think it doesn't seem it did too bad. Gartner research report predicted that Vista business adoption in 2008 will actually beat that of XP during the same time frame (21.3% vs. 16.9%) while IDC had indicated that the launch of Windows Server 2008 served as a catalyst for the stronger adoption rates. As of January 2009, Forrester Research had indicated that almost one third of North American and European corporations have started deploying Vista. "Never underestimate the power of marketing – many people can tell you they don’t like Vista, few can tell you why." I don't like Vista primarily because of built-in Digital Rights Management (DRM). Any time I need to capture, edit and/or transcode audio and/or video, I need to go back to XP.